Keeping these homemade mosquito repellents handy is going to save a lot of hospital bills for you! Guess why? Because you should never underestimate the power of a mosquito and its dangerous bite! You never know. You could be deeply involved in reading your favourite novel or trying to make a mark of victory in your favourite video game and a creepy mosquito can sneak out of nowhere to ruin your moment and you know the rest of the story! Hospital bills are a secondary issue. You will have to deal with the annoying symptoms first! Here’s a simple trick to save you from all the menace and prevent some dreadful diseases such as dengue, malaria, chikungunya or any other mosquito-borne illness. These easy homemade mosquito repellents will save a lot of your time, energy and money. How To Make Homemade Mosquito Repellents? – Get Set To Prepare Some Amazing Sprays! Prepare these easy homemade mosquito repellent recipes and put them into your handbag before you are all set to hit your favourite holiday spot! You can also place some of them at the corner of your room so as to repel the mosquitoes and bugs. Ensure that you use them more often during rainy seasons as mosquito breeding occurs more commonly during this season. The liquid is so effective in dealing with mosquitoes, it can save those extra bucks for you because once you realize how easy it is to prepare, you will stop purchasing a mosquito repellent liquid and instead, prepare the liquid on your own. The strong and pungent aroma of camphor keeps the mosquitoes away. In addition to this, basil leaves contain a compound called estragole which gives a distinct aroma and flavour to basil leaves making this the most effective homemade mosquito repellent. Boil a handful of basil leaves in water for 5- 10 minutes. Let the water absorb the essence of the oil. Collect the basil water and discard the leaves. Add one teaspoon kerosene to this water along with 2-3 camphor balls. Place the liquid at the corner of your room and you will see the mosquitoes and bug being repelled within a few hours because of the repellent properties of this liquid(1). 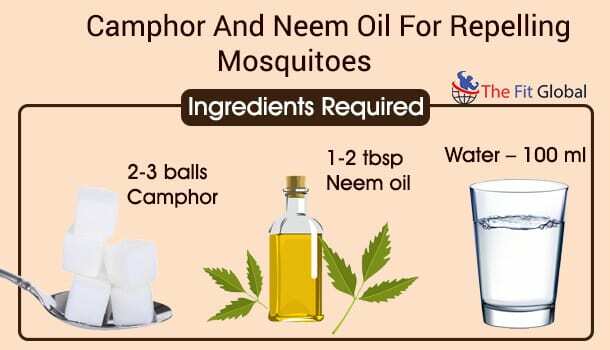 Get excited to prepare this DIY mosquito repellent using neem and coconut oil as the ingredients because studies have proven that adding neem to the lamps containing kerosene causes a significant decrease in the number of mosquitoes and has also decreased the number of Malaria cases in the past. The antibacterial and antifungal properties of neem work the best on your skin. 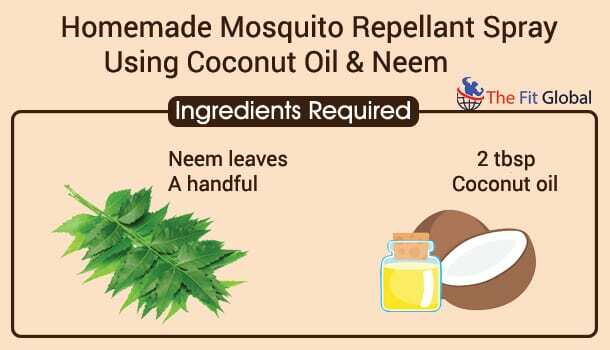 Adding coconut oil helps in a better and easy preparation of a homemade mosquito repellent spray by restoring the microbial properties of neem! Boil a handful of fresh neem leaves for 10-20 minutes. Collect the water and strain the leaves away. Add a few tablespoons of coconut oil to this. Take a 100 ml bottle and fill it with this mosquito repellent liquid. Use a spray bottle for convenience so that you can use it while travelling and making long journeys. You just have to spray the repellent once in every 10 minutes to keep the mosquitoes at bay. The most prevailing concern of mothers is how to protect the infants from the dangerous bite of mosquitoes. The oils extracted from the leaves of lemon eucalyptus are particularly used for the purpose of repelling insects and bugs. Adding an essential oil to this makes it the best spray for protecting babies from those pesky insects but it is mandatory for you to add a carrier oil as a direct contact of lemon eucalyptus oil to the skin may cause rashes and allergies(2). Take a 100 ml bottle (a spray bottle) and add lemon eucalyptus oil to this. Pour 4 tablespoons of sunflower oil to this and spray this on your baby’s skin to prevent the attack of mosquitoes. You can also use a cotton ball to apply the liquid on the baby’s skin every once in a while. Avoid using lemon eucalyptus oil directly to the skin. 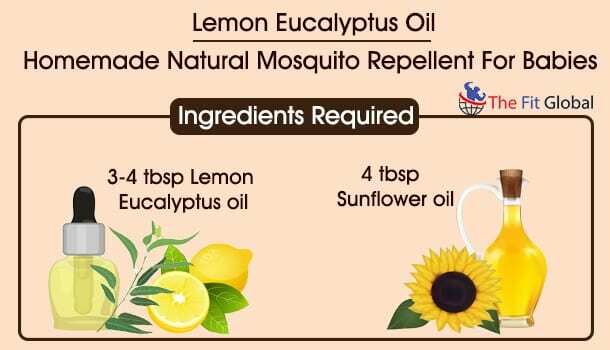 If there is no availability of sunflower oil, you can add any other essential oil to reduce the astringent properties of lemon eucalyptus oil. The antiseptic properties of garlic make it the best ingredient to use it as an insect repelling ingredient. Garlic also contains an organosulfur component called allicin in it which helps in repelling the insects and mosquitoes. The strong and pungent odour of garlic keeps the insects away from you. Crush the garlic cloves and add them into the boiling water. Collect the water and strain away the cloves after boiling the water for 10 -15 minutes. Take a spray bottle and add 100 ml fresh water into this. Add a few teaspoons of lime juice to this and keep this aside for half an hour so that the water absorbs the essence of garlic and lime. 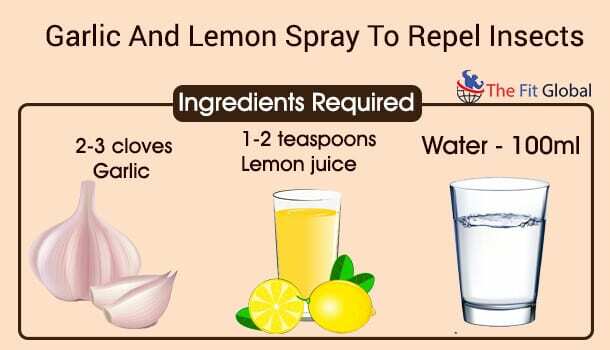 Spray the liquid over your body to prevent the attack of mosquitoes. You can also spray the liquid in the outdoor areas such as corridors and balconies or the open areas where you grow plants(3). Cinnamon contains excellent repelling properties because of the presence of components such as anethole, eugenol, cinnamyl acetate and cinnamaldehyde. The strong and pungent smell of cinnamon can also keep the ants away. 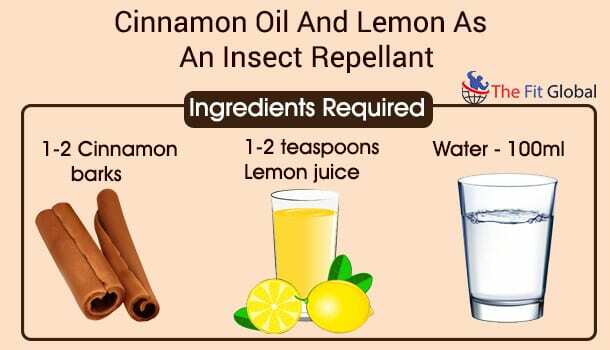 Here’s an easy homemade mosquito repellent that can be prepared using lime juice and cinnamon. Add 1-2 cinnamon barks into a cup of boiling water and heat the water for 5-10 minutes. Let the water absorb the essence of cinnamon leaves after which you can use a mesh to separate the cinnamon barks and collect the water. Add lime juice to this water and collect the liquid into a bottle spray. Use this effective homemade mosquito repellent to apply on the exposed parts of your body before going to sleep. You can use this anytime in the day so as to repel bugs and other insects. 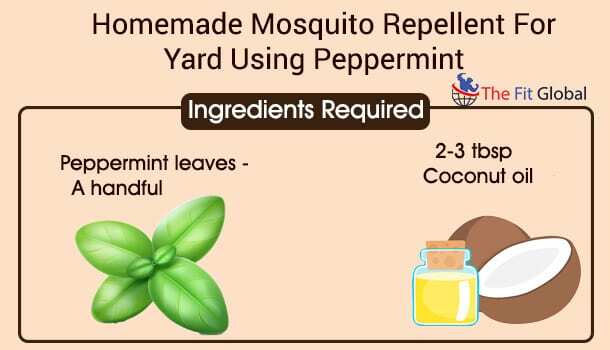 Peppermint contains two important components which are menthol and limonene which makes this the best repellent to keep mosquitoes and other insects away. Adding coconut oil to this helps in restoring the repellent properties of peppermint because of the fatty acids present in the oil that prevent the evaporation of the essential components(4). Boil a few peppermint leaves in a cup of water for 15-20 minutes and cover this with a lid to ensure that a quick absorption of the peppermint leaves by the water takes place. Use a mesh to separate the leaves from the water and collect the water into a bottle spray. Add coconut oil to this and shake the bottle well so as to mix the ingredients. You can also apply the liquid directly on to your skin to protect yourself from the attack of insects. Spraying the liquid all around your room can also prevent the insects from entering into the room. Citronella is especially known for its insect repellent properties because of its distinct fragrance that keeps the mosquitoes away. The oil is extracted from the grass of South Asian variety and this is also used in the preparation of various soaps, candles, perfumes and room fresheners. However, it is recommended that you check the credibility of the product before using it because citronella oil can get evaporated too fast if it is not prepared using the right formula. If the product is of a rich quality, it can work as effective as diethyl-meta-toluamide (DEET) which is the most common ingredient that is used in repellents(5). Take 100 ml water in a bottle and add citronella oil into this. Shake the bottle well and spray this liquid around your room, in your cupboards and desks and wherever you feel a need to spray this to repel the insects and bugs. You can also apply citronella oil on your skin but it is a general rule of thumb that essential oils should not be applied on your skin directly. Ensure that you mix any other carrier oil like coconut oil, avocado oil so as to prevent the skin itchiness and irritation. Try choosing almond oil since it works as the best for carrier oil. 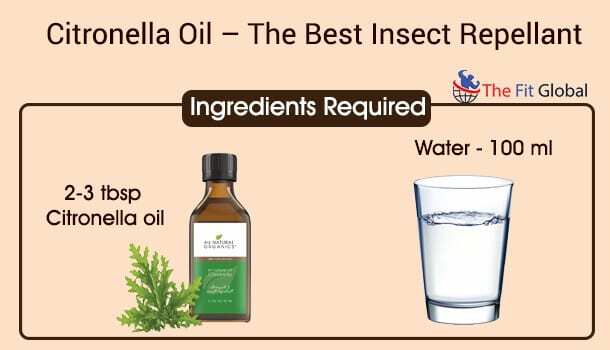 One easy homemade mosquito repellent recipe which not only works for repelling mosquitoes but also works the best in an effective treatment of mosquito bites is tea tree oil. This is because tea tree oil contains anti-inflammatory and antiseptic properties which heal the insect bites and prevents the onset of some dreadful diseases that occur due to mosquito bites. 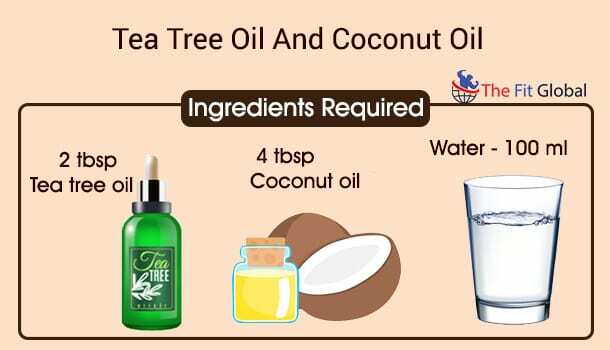 Take a few tablespoons of tea tree oil into 100 ml water and add coconut oil to this. Mix the ingredients well and collect the liquid in a bottle spray. Apply the oil on the exposed parts of your body before going to sleep. You can also carry the oil with you while travelling to long distances or during long journeys so that they are handy to protect your skin from unexpected insect attacks. They work the best to soothe the inflammation caused due to insects as well as the best handmade insect repellents(6). 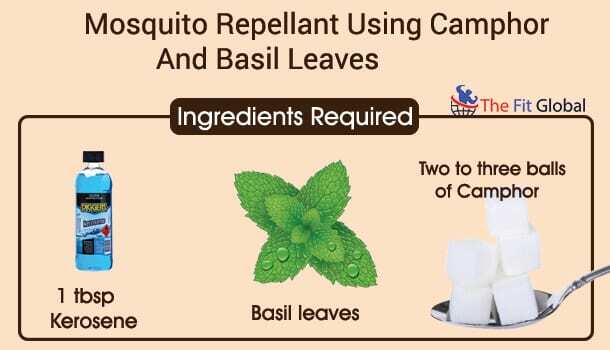 Using camphor along with any essential oil shows the best result as a homemade mosquito repellent since both the ingredients individually contain strong insect repellent properties. Camphor is being used as an age-old remedy for repelling insects because of its strong odour. The smoke that is emitted after lighting camphor helps in eradicating the mosquitoes up to a large extent. Neem oil, on the other hand, can help in keeping the mosquitoes away for at least a time period of 12 hours. Crush or squeeze the camphor balls using your fingers and put them in water. You can drop the camphor balls directly into the water since they are can easily get dissolved in water. Add neem oil to this and shake the bottle vigorously so as to mix both the ingredients. Store the liquid in a bottle spray to use this as a room freshener or to spray this in the open corridors where mosquitoes and other insects are most commonly seen. It is quite surprising to know that certain plants do not attract insects. Instead, they repel the mosquitoes and other insects because of the presence of a special alcoholic component called geraniol in their plant parts. The component is also the main ingredient in some essential oils like citronella oil, palmarosa oil and rose oil. Geraniol has been an effective insect repellent for 19 years and the ingredient is known to show the repelling effect for at least 2-4 hours of its application. Geraniol has a strong odour which keeps the mosquitoes at bay. You can use the ingredient to spray it on the plants that you have been growing in your corridors since the activity of mosquitoes is rapid near plants. Light 2-3 camphor balls and place them at the corners of your room. Try using mosquito nets such that your sleeping area is enclosed and secured to prevent the attack of insects. Make use of room fresheners to repel mosquitoes. You can make use of the above mentioned essential oils as an effective remedy. Light citronella candles occasionally to get rid of insects from time to time.